Eerdmans Books for Young Readers, 9780802854513, 34pp. Nino doesn't have a dog, but he likes to imagine that he does. His imaginary dog chases squirrels and plays in the lake with him. His imaginary dog licks the tears off Nino's face and helps Nino feel less lonely while his dad is traveling. But when Nino gets a real dog, it's not quite what he expected. As he spends more time with his dog, though, Nino learns how to be content with what he has, but that doesn't stop him from continuing to dream. This award-winning book beautifully depicts the art of finding a balance between imagination and reality. Edward van de Vendel has written dozens of books for children and young adults. In 2011 and 2012 he was nominated for the Astrid Lindgren Memorial Award. He lives in the Netherlands. Visit his website at www.edwardvandevendel.com. 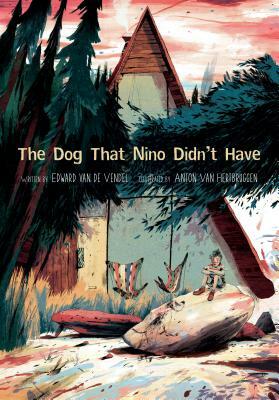 Anton Van Hertbruggen has illustrated two critically acclaimed books and has been published in international newspapers and magazines such as The New York Times and The New Yorker. He lives in Belgium. Visit his website at www.antonvanhertbruggen.com.